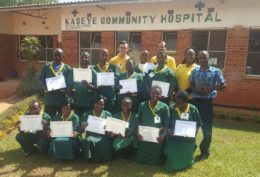 Faculty members in the Wright College of Nursing and Health created a training program for nurses in the Kaseye Community Hospital in Malawi. The journey to Malawi, Africa, began in Canada with an organization called Change and be Changed. Managed by Wright State professor emeritus Thomas Hangartner, Change and be Changed takes Wright State study abroad students to Malawi each year to work with hospitals. When Rosemary Eustace, associate professor in the College of Nursing and Health, learned of a global health nursing opportunity through the organization, she knew she had to get involved. Eustace and her colleagues Harriet Knowles, Cindra Holland and Sherri Gunasekera, nurse educators in the College of Nursing and Health, along with Michael Gilles and Benjamin Fornshell, two nurses from Premier Health, organized a trip to Malawi to teach nursing assistants in the Kaseye Community Hospital the skills to provide basic patient care. Cathy Marshall, a nurse from Canada who is also part of the project, traveled to the Kaseye Hospital to complete a community assessment prior to the implementation of the training program. The group named the project Wholehearted Resources In Global Health Teamwork, or WRIGHT. Fornshell said the goal of WRIGHT is to share knowledge and skills with Kaseye health care workers, including nursing assistant, to improve patient care. 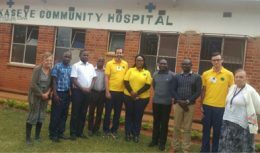 Eustace, Fornshell and Gilles, along with William Kayira, the director of nursing at Kaseye Community Hospital, implemented a nine-day training program, which was guided by the concepts of caring, cultural sensitivity and teamwork. One of the most important aspects of the class was discussing a change in attitude, especially when it comes to changing procedures and policies. A graduation ceremony was held for nursing assistants who completed the program. During the class, each nursing assistant was given donated uniform top in Wright State colors, which were made in Tanzania, and a name badge with the project logo. A graduation ceremony was held for participants who completed the program, and each student received a donated nursing assistant pin and a certificate of completion. Suzanne and Raymond Reinard, grandparents of Annemarie Laws, a former global health study abroad student to Tanzania, also donated aprons the nursing assistants can use when they serve meals to patients. Senior nursing student Lia Jones will complete a follow-up visit to the Kaseye Community Hospital in August. In the future, Eustace and her team hope to send more volunteer nurses to visit the hospital and enrich the relationship between Wright State and the hospital. For the past four years, Eustace has also taken an interdisciplinary group of Wright State students to Tanzania as part of a formal global health study-abroad program. The next tri will take place May 20 to June 4, 2019. To learn more, contact Eustace at rosemary.eustace@wright.edu.